When is Milky Way Day? I have recently learned that Carl Sagan’s Cosmic Calendar idea, which I have talked about before, may be gaining traction in the minds of some humanists, so I’ll make a concerted effort to mark the key cosmic events through the year. If I miss one, please let me know. I previously placed the Milky Way’s formation at the first of May – a nice confluence with other holiday traditions. But, since the Cosmic Calendar is based on empirical knowledge, I would like to use this post to acknowledge that both of the numbers that feed into the calculation of which day is “Milky Way Day” were problematic, and to consider the implications for our holiday. The first inaccurate number was the age of the universe: my first calculation was based on an age of 15 billion years (a nice round number that I picked up from I-don’t-know-where). In fact, best estimates put the Big Bang about 13.7 billion years ago. * That changes the scale of everything (from about 41 million years per calendar day to about 37.5 million). That gives us a range from April 6 to July 11. Now, I’d be all for a 3-month-long humanist festival celebrating our local stellar metropolis … but some people might think this impractical. So, happy Milky Way Day! What will you be doing to commemorate this momentous event? Will you try your hand at a star-formation game? Will you look for spiral shapes in your environment? Or will you just spend some time outside tonight, gazing at that pale band of light across the sky? * Observant readers will note that I often just reference Wikipedia in my fact-supporting links. I do research beyond Wikipedia, but in an effort to avoid link soup, I limit the number of links I provide. If there is relevant information elsewhere, I will link to it. If Wikipedia seems to be weak on a particular topic, I will look elsewhere. Otherwise, it’s a reliable standby. 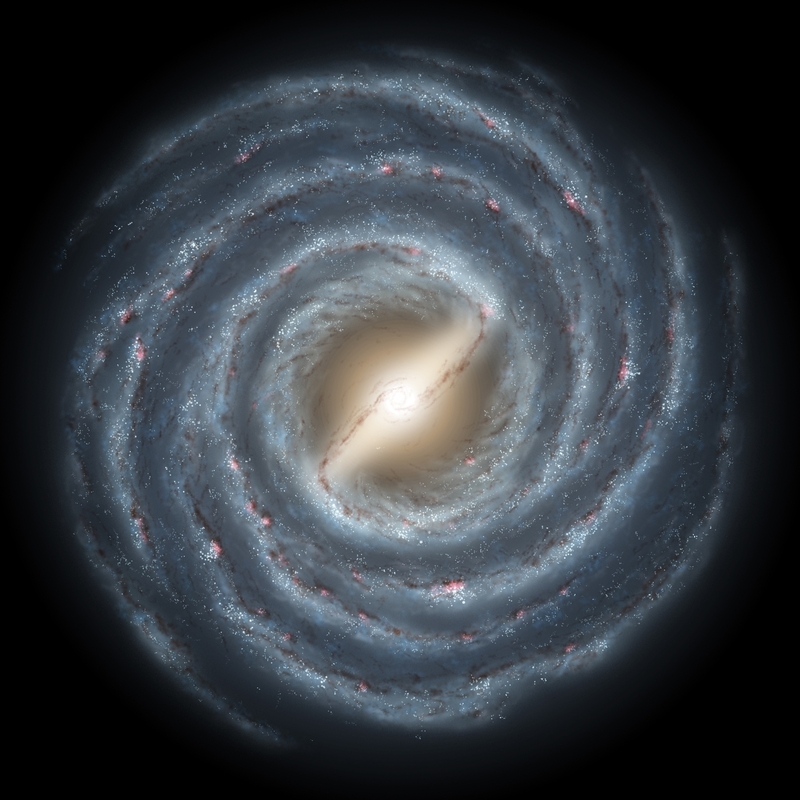 Opening image of Milky Way by R. Hurt. Obtained via Astronomy Picture of the Day. Believed to be public domain. 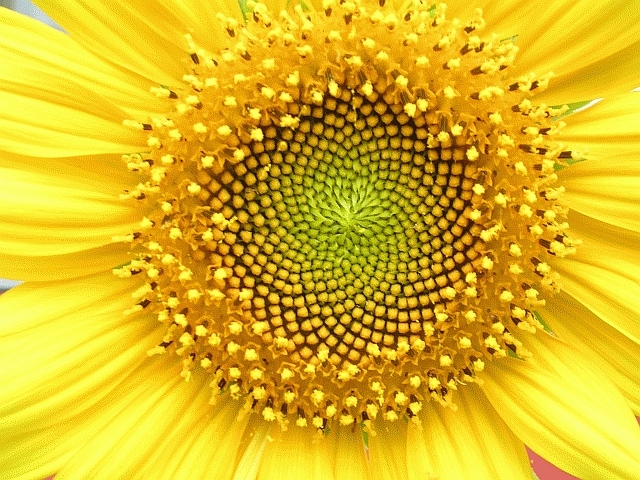 Sunflower from Wikipedia, copyright L. Shyamal, distributed under the CC Attribution Share-alike License 2.5. Joss Whedon, creator of great television shows like Buffy the Vampire Slayer and Firefly, has won an award for achievement in cultural humanism from the Humanist Chaplaincy at Harvard. Here’s part of his excellent acceptance speech. Is this why I love his shows? Because he’s a humanist? Hat tip to Hemant, the Friendly Atheist. I am not a philosopher, but I think this is a fascinating question to explore. I’d like to point you all to a post by Christian blogger Ken Brown, in which he explores the implications of an interventionist god who does not prevent all evils. We had such a vigorous discussion in the comments that he made a second post to further explore the difference between theistic and atheistic approaches to morality and the problems of evil. Please read the comments there and participate if you are so inclined. My question for you, my dear readers, is what you think the nature of morality is? Ken sees moral codes as truth claims: if something is good, that is a fact about the world, in something like the way that gravity or the structure of the atom are facts. So, is a claim like “Murder is bad” something that can be true or false in an objective sense? I see moral codes as personal choices – sometimes (nearly) universal, but nevertheless inherently subjective. I follow Hume in seeing “is” and “ought” statements as inherently separate types of statements. Is a claim like “murder is bad” more of a preference than a fact? This divide is not simply a theist-atheist divide: I know atheists who would agree with Ken that morality has an objective basis external to us, and I suspect that there are theists who do not. What do you think? How do you understand morality? Sometimes, I decide to share something which contains no intellectual contribution, no illustration of the value or comfort or truth of the humanist life. Sometimes, in short, I just want to hoot and holler and make sure my fellow apes notice me. The latest addition to our home humanist library arrived yesterday. It’s Dale’s new book, Raising Freethinkers. I haven’t read any of it yet – I’ll make sure to get some sort of review up when I do. In the meantime, let me give you the two items that are sure to be highlights. One is where he mentions the HSS Thought for the World campaign (which I’ve discussed a couple of times on this blog). And who do you think got into the list of “British humanist thinkers” that have been featured in “this brilliant podcast”, alongside people like Stephen Law, Nigel Warburton, and (he says with a slight gasp of awe) A. C. Grayling? Me, myself, and I! (see page 244, last paragraph). The blog of a smart and (yes) friendly Canadian humanist in Scotland. One of my favorites for quiet intelligence. Sigh. Thankyou Dale, for feeding my inner ape. A rainbow is a beautiful sight. 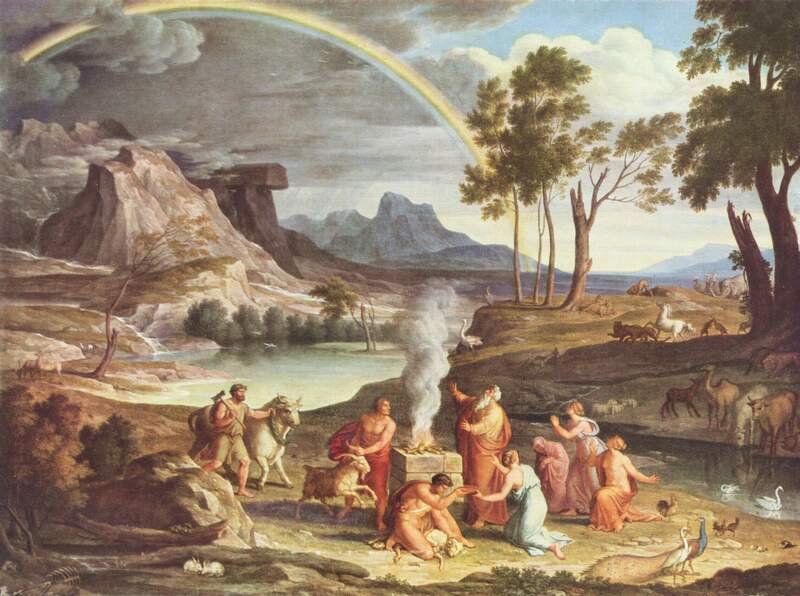 Rainbows have inspired people for ages, spawning many myths and poems. I can almost understand his sorrow – mystery is beautiful, and when knowledge expands, mystery seems to retreat. But what a narrow view of the world, to think that more knowledge, more understanding, somehow robs the world of its mystery and its beauty. Let me relate a personal account. It begins with a book, whose name is taken from the passage above. In Unweaving the Rainbow, Richard Dawkins shows not only the glory and delight of discovery that lies at the root of scientific pursuits. He gives us a glimpse of the deeper beauty revealed by those pursuits. He reminds us (for example) that Newton’s work on optics has been carried on. We now know that visible light – spanning the colours of the rainbow – is but a tiny slice of a great continuum. The electromagnetic spectrum extends off the red end of the rainbow into infrared and radio waves. Off the other end, we get ultraviolet, x-ray, and gamma waves. The rainbow we see is only a fragment – the tiny slice of that greater spectrum, visible to our pragmatically-evolved eyes. I was on a train, some weeks after reading Dawkins’ thoughts. Looking out the window, I saw a rainbow, gliding along the nearby hills, keeping pace with us. It was soft and faint, as beautiful as the first rainbow I ever saw as a child. But this time there was something more. As I stared at it, I thought of it not simply as a strip of colours, but as something greater and deeper – the full spectrum of light. Of course, I still didn’t see those other colours. Knowledge had not altered my eyes at all. But it was as if I could almost feel them. Like when you hear a loved one walk up behind you. All that you physically sense is the sound. But you know what they look like, how they walk, how they stand. How tall they are. How likely they are to tickle you if they get close enough. With the sound of their steps and their breathing, your mind calls up all of this knowledge, filling in the experience for you so that you can almost see the person behind you, almost feel their movements and expressions. In just that way, I felt the invisible rainbow filling the sky outside my train – down to the centre of the arc and out as far as the sky went. It was magnificent. Such glory; such encompassing beauty. Beauty that I would never have known if the rainbow had not been “unwoven”. Thankyou, Richard Dawkins, for helping me to see this. Thankyou to every scientist who gives us the chance to see the unseen, hear the unheard, touch the untouchable. We are, and forever will be, surrounded by a sea of mystery. What delight to be able to reach into it, to see the wondrous glory that is only accessible by the tools of science – Keats’ “cold philosophy”. Cold? The thought of all the knowledge, all the enrichment of subjective experience that science can give us, warms my very being. I wish I could show Keats the rainbow I now see, thanks to scientists like Newton. But I’ll have to content myself by sharing it with you. 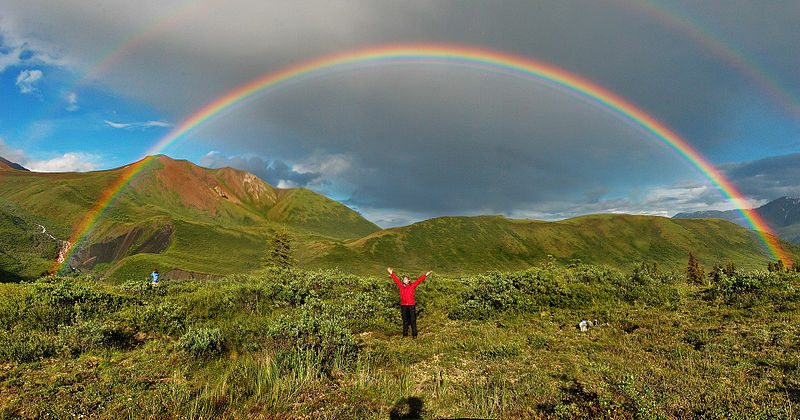 May you feel the same exhilaration I feel at the sight of every rainbow! The rainbow images are from the Wikipedia article on rainbows. The first is public domain; the second is licenced under an Attribution ShareAlike Creative Commons licence by its creator, Eric Rolph. The spectrum illustration is from the Wikipedia article on the electromagnetic spectrum. It is licenced under an Attribution ShareAlike Creative Commons licence by its creator, Tatoute.